I read this article and found it very interesting, thought it might be something for you. The article is called Delaware Chickens and is located at https://www.chickencoopguides.com/breeds/delaware-chickens/. Raising chickens is becoming a popular hobby in suburban areas as well as farms and rural spaces. 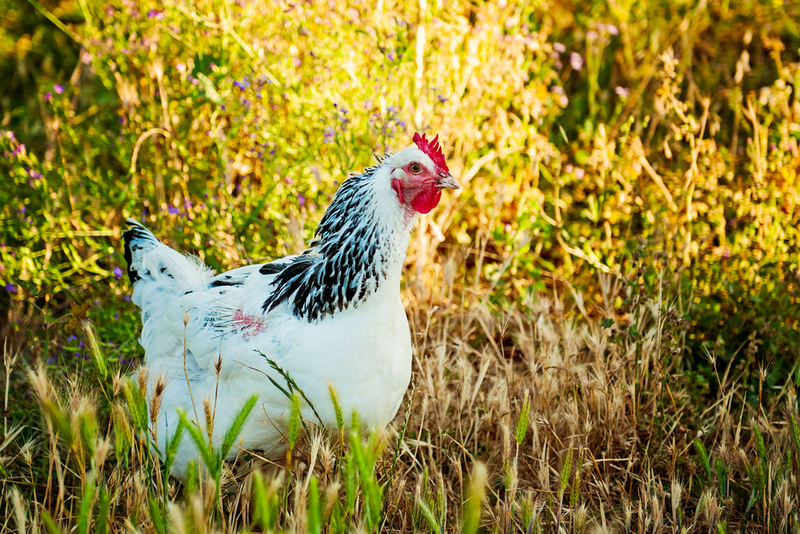 Not only do chickens make good pets, but they also provide eggs and meat so they offer many benefits for people interested in self-sufficiency and living a “green” lifestyle. There are numerous different breeds of chickens, and each one has advantages and challenges. The key to starting your own backyard flock is determining which breed will work best for you and then creating the ideal living conditions for your flock to stay happy and healthy. Delaware chickens are a good choice for many people, and learning about the pros and cons of this breed can help you determine if they’d be a good fit for your flock. If you’re looking to get lots of eggs from your backyard flock, Delaware hens may be an excellent choice. The chickens are a beautiful white color with black speckles along the neck and dark feathering at the rump. Delaware chicken eggs are large to jumbo-sized and are a beautiful brown color. Most hens lay at least four times per week. This breed is also good for meat, so your flock of Delaware chickens can serve dual purposes. The birds are curious and intelligent and generally known for a docile and calm disposition, though they can be aggressive when afraid. Delaware chicks grow and feather rapidly, so it’s fairly easy to increase the size of your flock quickly. The rapid maturation rate means the chickens are ready for butchering at an earlier age than some other breeds. Some people notice that Delaware chickens tend to be noisier than other breeds. If you live in a neighborhood with other houses close by, you may want to look for a quieter breed. Additionally, the hens are not very “broody,” so if you want chicks, you will probably have to incubate and raise them yourself rather than relying on the hens to rear them naturally. The white color makes these chickens more noticeable at night, so they may be more susceptible to predators than dark-colored breeds. It’s important to give your flock enough room to roam as well as a cozy coop for protection from the weather and predators. A coop also encourages your hens to lay eggs in the same spot every day, which makes collection easier. Most Delaware chickens enjoy foraging to supplement their diet, and it’s essential that your chickens always have access to fresh water. Chickens also enjoy getting treats and may enjoy being petted or held if they are handled often when young. Many people find it easiest to buy a chicken coop and design fencing around it. Depending on how much room you have, you may want to build a permanent chicken enclosure or use a moveable chicken tractor to transport your flock to different areas. This is especially useful if you want to use chicken manure as fertilizer. If you want to add a dual-purpose breed to your backyard chicken flock, Delaware chickens may be right for you. They’re excellent egg layers, and the large brown eggs can even fetch a slightly higher price than typical white eggs. Delaware hens are generally calm, and the chicks mature rapidly so they can create an excellent sustainable flock of meat birds.